There has been nothing normal about Markelle Fultz's start to his NBA career, so a mini-controversy involving deleted tweets and the trainer who was trusted to rebuild his shot seems par for the course in Philadelphia. Early Monday morning, following a blowout loss at the hands of the Brooklyn Nets, Fultz's name surfaced in an online beef between trainers Drew Hanlen and Clint Parks. Parks, who trains NBA players including Kyle Kuzma, was chiding Hanlen's "Pure Sweat" imprint following an ugly jumper from Fultz in the third quarter of Sunday night's game. Hanlen fired back at Parks, and included a detail about Fultz's health that set off some alarm bells. The reply shown below has since been scrubbed from Hanlen's account. 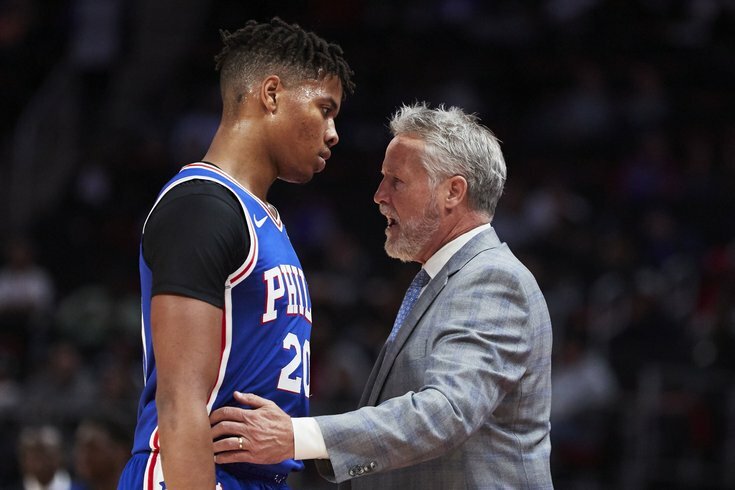 Given the checkered history for Philadelphia on medical issues and the public saga Fultz has gone through since leaving the University of Washington, the suggestion is worthy of closer scrutiny. The franchise just departed with a GM in June whose downfall was being connected to secret Twitter accounts, so a trainer who works with two of their most prominent players (including within the team's practice facility) is well within the sphere of credibility. Philadelphia is coming off a stretch where they played five games in seven days, and Fultz has continued to play a fairly prominent role in the team during this loaded part of the schedule. Separate discussions took place between members of the Sixers' organization, Hanlen, and Fultz after Hanlen's tweet surfaced on Monday, PhillyVoice has been told, and there is no indication of an underlying concern that would impact Fultz's ability to contribute. Dialogue between the organization and Hanlen specifically is not exactly unprecedented over the last half year or so. Multiple sources who spoke to PhillyVoice about the offseason program claim the Sixers paid Hanlen themselves to work with Fultz. The team kept tabs on Fultz as he ingrained himself in Hanlen's Los Angeles workshop over the offseason, with Brett Brown having admitted on record to taking trips to visit with Fultz, Joel Embiid, and Ben Simmons in L.A. during the offseason. The Sixers will conduct practice on Tuesday afternoon before heading to Indiana for a nationally-televised game against the Pacers on Wednesday night. The second-year guard is expected to check in with members of the organization again tomorrow, and Fultz will likely address the situation himself before Philadelphia goes back on the road. Team representatives for the Sixers would not offer official comment on the situation.